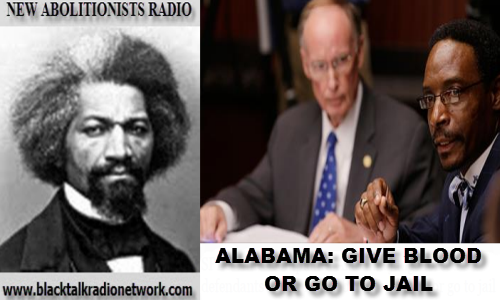 Tune in for two hours of news, information and commentary concerning legalized slavery and human trafficking. Due to unforeseen circumstances, our America is Ferguson Series will continue next week. Feds finally start tracking the true number of people killed or shot by police in the United States? Considering US Attorney General Lorretta Lynch’s recent rejection of requiring police to report shootings to the feds, many activist remain skeptical. A Sherriff blames jail overcrowding on the for-profit prison and jail industry. This week’s Rider of the 21st Century Underground Railroad is Donald Eugene Gates, a man who spent 27 years in jail after being wrongly convicted of a crime he didn’t commit. Our Abolitionist in profile tonight is evangelist, abolitionist, and feminist, Sojourner Truth (c. 1797-1883) Expect all of that and more tonight on New Abolitionists Radio! Unfortunately, Max will not be with us tonight as his wife and partner in abolitionism suffered a medical emergency and has been hospitalized. Please keep Tribal Raine in your thoughts and prayers. 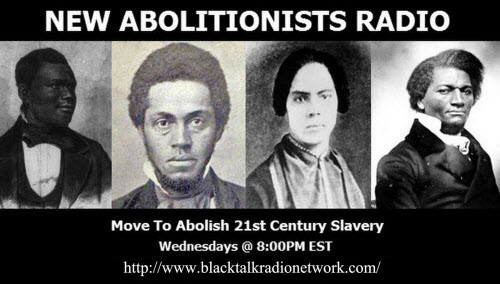 Tonight will host open phone lines and an open forum on the issue of legalized slavery and human trafficking. We will also share news related to the issue. Pennsylvania was sued by political prisoner Mumia Abu-Jamal over the withholding of medicine from prisoners by prison officials. Oral arguments were heard today in the case Abu-Jamal v. Kerestes. Twelve students from Black Students United — a student-run umbrella organization representing the interests of black Cornellians — entered President Elizabeth Garrett’s office Tuesday to submit a letter outlining demands for the University to divest its endowment from interests based in prisons and mass incarceration. California officials voted on Thursday to divert US$500 million to open new jails, replacing jail beds with medical and mental health beds. Criminal justice and civil rights activists protested the decision, which counters the purpose of the popular Proposition 47, passed last year to re-classify low-level felonies to misdemeanors and redirect funds to reduce recidivism. The Ohio ACLU reported on a new trending issue within the jails that involves inmates being forced to pay fees during incarceration. November 11th 2015: Today is Veterans Day and in case you didn’t know it, veterans make up 3/4s of a million people in our for-profit prisons today. Nothing says thank you for your service like being baked to death” inside a sweltering jail cell on Rikers Island as was the case with homeless veteran Jerome Murdough whose only crime was trying to stay warm outdoors on a cold night. The truth is millions of Americans are not enjoying the freedoms they gave their lives to gain. No one is safe from slavery. Not even our veterans. • In a research article by Scotty Reid we discovered that US taxpayers are spending an estimated $15,653,500,000.00 dollars per year to incarcerate veterans over non-violent drug offenses. • The GEO Group and CCA, two of America’s top private prison enslavers had their quarterly earnings report and as usual Yohanan will give us the breakdown from the transcripts. If you want prophesies of prisons these are the men and women who will tell you where things are going. Straight from the enslavers mouths. • In our America is Ferguson Series we examine the state of New Hampshire today.